SOME BASIC TIPS & TRICKS ABOUT HAIR COLORING. These are mostly applicable when doing full head coloring and when going darker. All hair dye has been designed to work best on dry, unwashed hair. The oil from your hair will protect the scalp while it is being colored. All you need to do to prepare the hair for coloring is comb it finely so that you are ready to start sectioning. Do a very accurate assessment of every part of your client's hair. The key questions you need to ask yourself are (a) "What level is the hair now?" and (b) "What level do you need to lighten in to?" The difference between the two will help you determine the strength of developer you will use and whether pre-lightening is required or not. 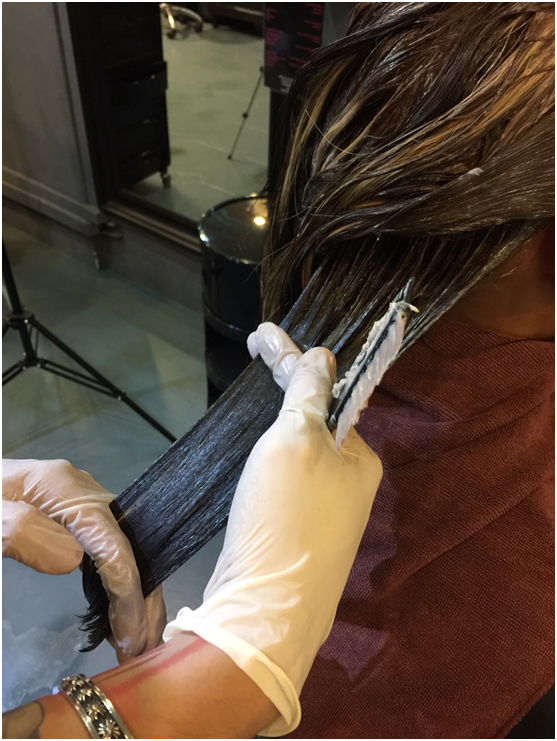 If the regrowth area is darker than the lengths, and you are looking for one consistent color, you will need to deal with that part first using either lightener or a high lift color. You need to make the whole head one consistent level of color before doing a full head color application. 3. Choose the correct strength of developer. For level on level coloring, use 10 Vol developer. For 1-2 levels lift, use 20 Vol developer. For 2-3 levels lift, use 30 Vol developer. For 3 levels, use 40 Vol developer. For more than 3 levels, use either a high lift color or do pre-lightening. If you are toning we generally recommend 20 Vol not 10 Vol. You will get better vibrancy that way. Similarly, if there is a lot of grey hair to be covered, we recommend 20 Vol. You will be able to open the cuticle up more and get better color penetration using 20 Vol developer. 4. Measure the hair dye and developer carefully. The right mix between hair dye and developer will have a huge impact on the hair color result. If you put in too little developer, you won’t be opening the hair cuticle enough. If you put in too much developer, you will be lightening the hair but not depositing enough hair dye and the color won’t last. So always measure your hair dye and developer properly. How do you measure? Ideally, we recommend using either kitchen scales or a measuring bowl with markers. For most Ugly Duckling hair color, the correct mix is 1 part hair dye to 1 part developer. For high lift colors, the correct mix is 1 part hair dye to 2 parts developer. For toners, the correct mix is 1 part toner to 2 parts developer. If you are bad at using kitchen scales and if your bowl does not have clear markers, you can look at the volume of contents marked on your products & work in that way. For Ugly Duckling toners and high lift colors, again for 1 tube, you will need to pour in 7 oz of developer. 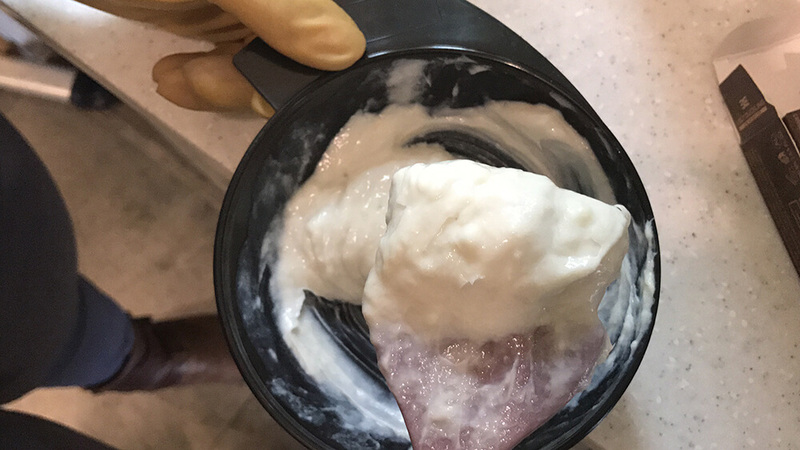 This is what a 1:1 hair color mix looks like - 1 part color to 1 part developer. Part the hair into big sections. 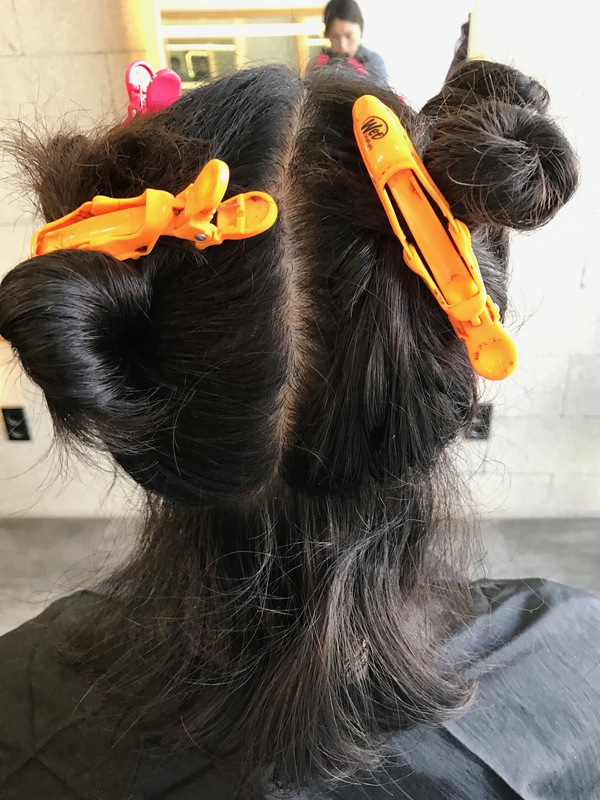 Tie up sections with a clip. Leave one section (usually the lower back section) down. On the unclipped section, start taking ¼ inch mini-sections in order to apply the color with your dye brush. Lift each strand up and apply color from just away from the scalp to the ends. Neat, even. fine sectioning is really really important. Otherwise the whole thing will end up being a mess! Once you have completed 1 big section in this way, pin up again. Then start on another section and do mini sections on this one in the same way. Repeat on all sections until you have finished coloring the hair. Section hair into large sections and pin up. In order to get the most vibrant color possible, you must use enough product mix and you must saturate the hair properly. Run through the hair a second time after applying the color, with fingers (wearing gloves). Don't hesitate to make a fresh mix if you have run out of product. Ugly Duckling color tubes are fairly large - 3.5 oz compared to the usual 2 or 2.5 oz. So one tube of color with 7 oz of developer should give enough mix for most full head applications. By using your fingers you can spread out the color (avoid patches) and also deposit more color into the cortex just as the cuticle is opening up. This is what makes the color really intense and vibrant when you are dyeing hair. If your customer has white hair, you should also cross-check how well you have covered the white hair by re-sectioning the hair and checking that all white hair has been properly covered. Some areas such as the nape area are particularly resistant and you need to pay particular attention here. Avoid using combs to color or re-color, as you can end up ruining the hair cuticles which have been opened in the coloring process. For most colors, the processing time is 30 minutes. For toners, rinse off when the correct color appears (around 10-15 minutes is normal). For high lift colors: up to 40 minutes. Be aware that hair at the scalp processes faster than anywhere else due to the heat of the scalp. 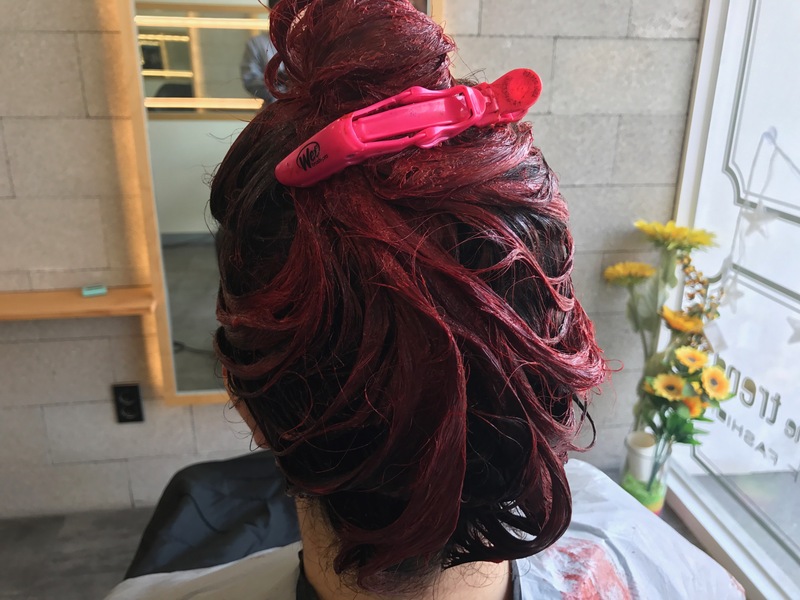 You need to watch this area when going lighter and be prepared to rinse as soon as this area looks done, even if this is before the 30 minutes are up. Before rinsing, add a little water to the color and rub at the scalp area. Then rub well around the hairline first, then middle and nape. This process is known as emulsification. It helps lock in the color into the hair, and gives you really vibrant, long-lasting color results plus hair that feels full and very well conditioned. 11. Shampoo using an acidic (low pH) sulfate-free shampoo, conditioner or mask. Use an acidic shampoo and conditioner. This will help close the hair cuticle, lock in the color and return the hair to its natural pH level. Don't assume all professional shampoo and mask is acidic and sulfate free. You will need to check on the label. NB For a new client we always recommend a patch test 24 hours in advance. Here's how to do it: make a tiny mix of the color to be used and developer and apply onto the nape area just behind the ear. If your client gets no reaction within 24 hours, that's good and you can go ahead and apply the color.